Memories fade away over time; And many a time they are invaluable if one captured some significant moments only on a camera. With the advent of mobile phones with camera in them, capturing any event has become more comfortable and convenient. Yet as iPhone camera can be used in any odd situations in haste, the images taken can be blurred. If you have an iPhone, then the picture quality of the snaps taken are some of the best, but still, they can be enhanced by using best free photo editing apps on iPhone or iPad. With some of the best free photo editing apps available in the iPhone, the snaps can be given a retouch as per wish. One can get hundreds of free photo editing apps to use in the iPhone, but not all are best to work with. Let us discuss some of the best free photo editing apps for iPhone to beautify your images. Bonus tips: Want to recover deleted or trimmed photos from iPhone? Gihosoft iPhone Data Recovery is always here for you and help you extract pictures from iTunes/iCloud backup as well. 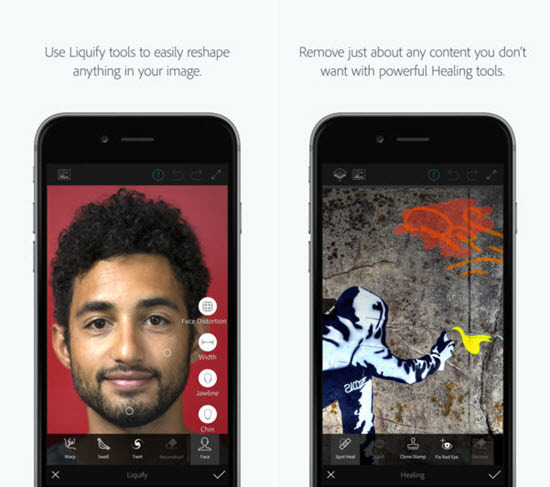 Why You Need a Photo Editing App on iPhone? Photos now are to keep the memory of some event alive. With the popularity of various social media increasing at a rapid speed, more and more people are using their iPhone as a camera and uploading the pictures on various social platforms to share with friends and relatives without much waste of time. Therefore, the demand of photo editing before uploading increases, especially for those taken photos which are not good enough to be shared online. In such cases, to have a good photo editor app on iPhone is important for a user, better free of charge. Here we will introduce some free best apps for editing photos and later sharing the moments instantly with friends and families. This is one of the best iPhone photo editing apps that easily make it place in the top chart as it is capable of capturing RAW images – It captures all image data sensed by the sensors of the camera while taking a photo. With this option, the image data can be enhanced four times as no image is compressed to a smaller data size. One can use the editing tools, and the filters present in the application to change the photo quality to a better size. If you want to give some painting effect to your photos taken on your iPhone, then this application is the best to use. It does incredible transformations after you upload a picture to the application server and gets it transferred to the famous painting styles of old days; It would resemble as a painting and not a digital snap after transformation. One can adjust the level of filters to give a weird and abstract look to the photos. 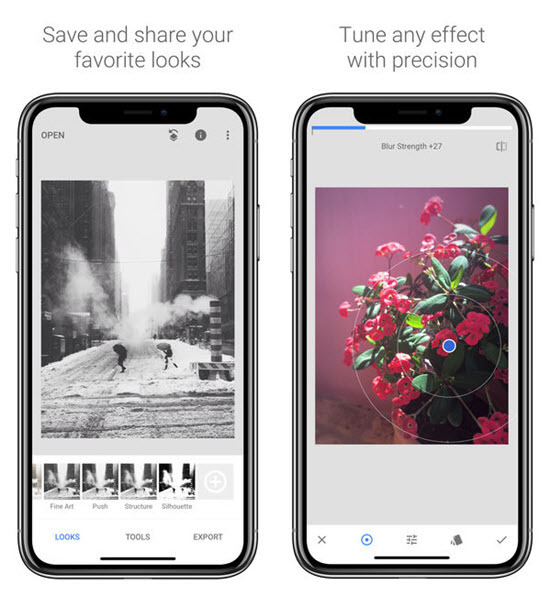 This photo editing app from the house of Google for iPhone allowing the user to preset the features and save them for future references, giving a quick solution for some particular image effects that may be required thenceforth. There are 29 filters and tools inside the app, and it can open RAW and JPEG files. One can adjust the color and the exposure of the photo automatically or can do it manually using this app in a convenient way. Those who are interested in photography know that Adobe has such a software named Photoshop, nearly becoming a synonymous for photo editing that almost all people rely on it to edit their photos. Meanwhile, Adobe has also come out with Adobe Photoshop Fix application for iPhone to edit photos, as an alternative to the desktop software. One can retouch and restore the images, change the facial expression like creating a bigger smile or sharpening the tip of the nose and many more with this app; one can rotate, reshape and resize the images through this application with ease; also, one can also adjust the brightness, vignette or the exposure and the resolution of the photos with this app. If you want to give some mystic effect to your iPhone camera pictures, then Len Distortions app is the most appropriate that can provide some extraordinary lighting effects looking naturally. Apart from the lighting effect, it has many necessary editing tools to be used with the layers and the effects. One of the significant advantages of this app is that, the light adjustment can be given on a selected subject rather than an entire photo. 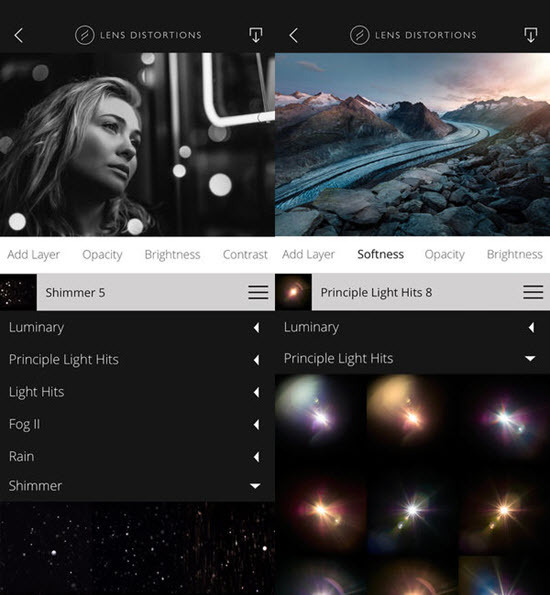 One can get many choices for the light filters and can use the fog, bokeh balls, snow, and shimmering, rain and blurs and flares effect. The app helps to get an artistic interpretation of the snaps that are taken by the iPhone camera. 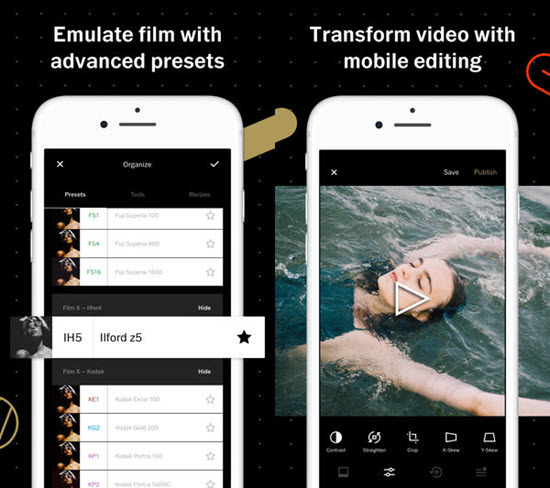 This is one of the highly rated and appreciated photo editor apps very popular among the iPhone users to edit their capture. With features like night shots and other filters, it transfers photos to a new height. It is very easy to use, and its features like highlight, tinting, shadowing and white balance correction can be done with ease. One of the advantages of this app is that the image will be automatically saved in the iPhone after the editing, is complete giving no chance of losing the editing work done. With above photo editing apps, your iPhone photos will gain the best effects that other photo editor apps can not provide. 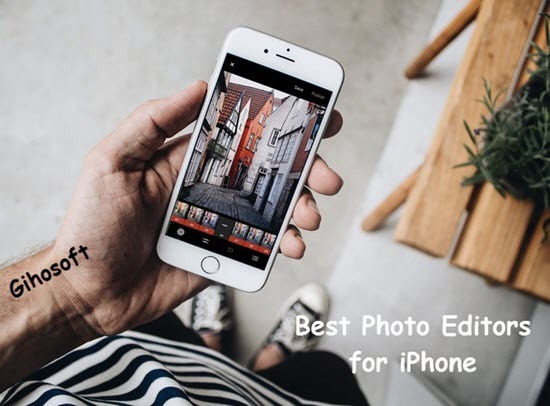 The ease of using, the speed of editing, the variety of effects and features in these free photo editing apps for iPhone make them popular among all and more people depend on them to enhance their shoots. Using one of the above apps a photo taken by iPhone can even compete with an image on DSLR camera. 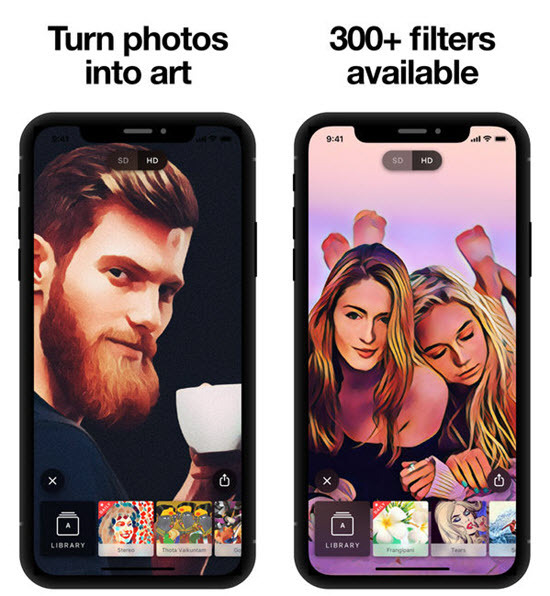 These apps continue being improved with upgrades of iPhone and become part of the essential apps installed for one to get a perfect snap and edit it with style. If you are a fan of editing photos, these apps are for you. And we sincerely appreciate any of your comment below, be it a question or a suggestion. Copyright © 2019 GIHOSOFT. All Rights Reserved.